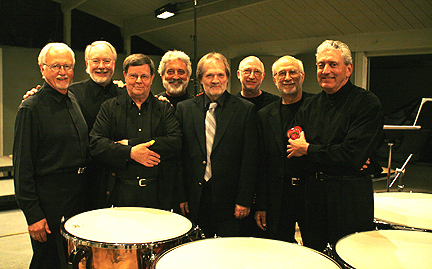 In each of four diverse programs at the Ojai (CA) Music Festival, NEXUS, the internationally acclaimed percussion quintet, brought audiences to standing ovations.Â This was the first appearance by NEXUS at Ojai, and each of the programs was distinctive. 1) June 8, 2007 – Masterworks of Bartok, Eötvös and StravinskyThe program featured NEXUS performing classic masterpieces with Pierre-Laurent Aimard and Tamara Stefanovich in the Bartok ‘Sonata for Two Pianos and Percussion’ and in ‘Sonata per sei’ by the Hungarian composer Peter Eötvös. Percussionists Jan Williams and Thomas Morris along with Pianists Helena Bugallo and Amy Williams joined the ensemble in an electrifying performance of Igor Stravinsky’s ‘Les Noces’. The milestone film by Tienosuke Kinugasa was presented at the Ojai Playhouse with a live musical accompaniment composed by NEXUS member, Bill Cahn,Â The score performed by NEXUS enhances this challenging avant-garde movie which utilizes pioneering film techniques employing classical Japanese arts, stylized images, flashback scenes, double-images and rapid cuts between scenes. Led by NEXUS, this workshop was open to the public and focused on freeform improvisation. The several hundred attendees listened attentively as selected audience members had the opportunity to create and record improvised music with members of NEXUS.Â The recorded improvisations were then immediately played-back for listening and interactive open discussion. 4) June 10, 2007 – NEXUS Solo ConcertFeaturing ‘Telisi Odyssey’ by Russell Hartenberger, ‘The Birds’ by Bill Cahn and ‘Blue Sky’ by Canadian Composer, Linda Catlin Smith, the classic NEXUS program also included drumming based on 18th century military music and on west African styles.